At the Texas Heart Institute, doctors have developed an artificial heart replacement that produces no discernible pulse or audible heartbeat. Put your ear against the chest of a patient with this implant, and all you'll hear is a faint humming sound. Touch their wrist, and there will be no pulse. The machine is a continuous-flow pump that consists of simple whirling rotors, which spin a patient's blood throughout his body instead of pumping it. 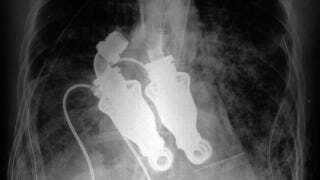 Since the device has just one moving part, it actually works better and lasts longer than other artificial hearts. Doctors have successfully replaced multiple calves' hearts with these centrifugal pumps, and recently tried them in humans. Sadly, the man who received the new implant died due to complications from his disease—but he lived for more than a month without a heartbeat.